What is the Dog Car Booster Seat? 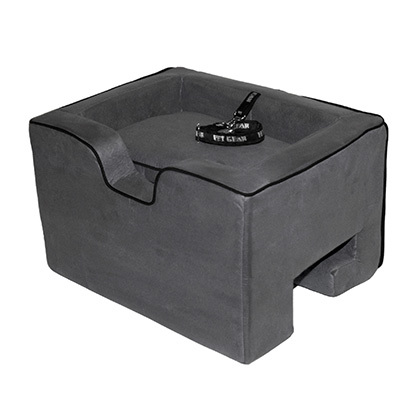 The Dog Car Booster Seat provides your pet with a comfortable resting area when traveling in a car with you. The additional height of a booster helps your pet see out the windows, which helps reduce anxiety in some pets. Available in 3 colors (Black, Tan, and Charcoal) to complement most car interiors. May help to reduce motion sickness. Perfect for road trips and even short trips to the store, vet, or to visit friends and family. Provides extra height to allow pets to see outside which can reduce anxiety. Leash attachment keeps pets from roaming around in the car. Easily hooks onto your pet's collar or harness. Helps to keep your focus on driving and not your pet's movement. Booster can be used in front or back seats. Booster cushion and covering have zippers for easy removal. Both cover and seat cushion are also machine washable. How does the Dog Car Booster Seat work? Car boosters are a great way to provide your pet with a comfortable resting area while also keeping your focus on driving. Slide your car's seat belt through the bottom of the booster. Once secure, place your pet on the booster and attach the leash to your pet's collar or harness. Adjust leash length if necessary. For small pets only read interior dimensions of product carefully. Measure your pet to be sure your pet will fit comfortably inside the seat. Place the car booster in the desired seating location in your vehicle. Slide your car's seat belt through the bottom of the booster until it is secure. Place your pet in the booster and attach the booster's leash to your pet's collar or harness. If the booster becomes dirty, the pillow and the booster's micro suede covering can be removed and placed in a machine washer. How many pets will need booster seats? The Large Car Booster can be used for two very small pets. We recommend using the medium booster for Teacup, Toy breeds and dogs and cats weighing 6 lbs or less, so your pet can lay down comfortably. Dogs and cats weighing 25 lbs or less (if using the large booster for two very small pets, the total weight should be less than 25 lbs).